THE roller here illustrated and described is made by filling an empty steel drum with concrete. The drum is not used merely as a mould, but is retained as the outer skin of the roller, and the concrete gives the necessary weight. Many of the types of drums available are formed with a number of corrugations at different parts of the height, and these would render the stripping of the mould difficult in any case. Bore the central holes in top and bottom of the drum; push the piece of gas-barrel through so that it projects about three inches at the bottom and an inch or so at the top; stand the drum on the ground, level, so that the bottom part of the gas-barrel goes into the soil. Mix up enough concrete from gravel and Portland cement; three of gravel to one of cement will serve. Wet the inside of the drum, and fill in the concrete, tamping it down with the end of a piece of quartering. Don’t put in large pieces of aggregate, and avoid empty ‘pockets’ in the filling. Let the concrete stand a week to set and harden. No more of the drum top should be cut away than is necessary to allow the concrete to be filled in easily; rely on the metal elsewhere to stiffen the roller and to hold the the spindle tube in correct upright position. The next job is to saw off the ends of the gas-barrel where ‘they project; if there is an upstanding rim or flange to the drum, the gas-barrel must be left long enough to clear this, or else the side irons will not fit. No rim is shown in the diagrams, but many of these details depend -on the kind of drum which is obtained; the dimensions of the yoke, etc. should be modified accordingly. When the ends of the gas-barrel have been sawn off, clean out any burr on the inside of the bore with a half-round coarse file. Two views of the side irons are given in Figs. 3 and 4; the latter shows how they are bent to reduce the span and fit them to the piece of oak which forms the shaft. They are let in flush to this shaft, in a shallow groove formed at each side. Four ¾ in. bolts secure the irons to the woodwork. Near the top end of the oak shaft a hole is bored to take a piece of ½ in. (nominal) gas-barrel, which forms the tee or cross-piece. It is driven tightly through, and secured further by a ½ in. bolt which passes clean through the oak and the tube, with a washer and nut underneath. (In making this hole for the bolt, drive the tube in place, and drill straight through the oak shaft and the tube at one go, so ensuring that the holes register.) The hole in the shaft to take the pipe itself should be approximately 1 in. in diameter (actual outside diameter of the tube is ‘J-gin., or in. larger); make an ‘inch’ hole with a bit, and enlarge it with a half-round rasp until the tube can be driven through. Having got the side irons bent and drilled, fit them temporarily to the oak shaft and mark carefully for the four gin. Holes to take the bolts. Bore these holes, and then again try in the irons, inserting bolts and loosely screwing on the nuts. The next job is to put the axle through. This is a length of §in. mild steel rod, threaded at each end far enough down—where it comes through the gas-barrel—to take nuts and washer. Going by the dimensions given in the diagrams, this means that the axle should be between 22 in. and 23 in. long; and the threaded part should extend at each end about 3in. Inwards. 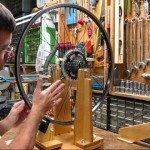 The axle is inserted and adjusted to the roller, and then the side irons are put on separately; next the oak shaft is bolted in place between the irons, and the staybolt put on and tightened up. Grease the axle and slip it through the gas-barrel, and put on a plain nut at each end, screwing it up so that about½ in. play is left between the inner face of the nut and the end of the gas-barrel. Next slip on a washer outside each nut and put on the two side irons. When the latter have been coupled together by the bolts, support the entire yolk and handle on a packing case so that it is level with the axle; now screw on an outer nut, leaving a little play between this and the side iron. When it has been made certain that the assembly is correct, a third nut should be screwed on outside of all, at each end, as a lock-nut to prevent the second one closing in on the irons. Two spanners are needed now; one is slipped over the second nut, while another is used to grip the outer nut and give it the slight extra grip to secure all firmly. Do not overtighten the lock nut. The innermost nut (that on the inside of the side iron) may tend to slip; this can be prevented by one or two blows with a small cold chisel, which drive some of the metal of the axle into the nut itself, and so lock it against rotation. A better method for the handyman with some dexterity in metal-working, and the necessary tools at hand, is to use a slotted hexagon nut for the innermost one. For this method, the nut is put on at the proper distance, and then is locked with a split pin which passes through two opposite slots and also through a hole which must be drilled through the axle. Also, by using a slotted hexagon nut and drilling the spindle again, we need only a single nut (the slotted one) outside the side iron. This is preferable where it can be adopted. Make a point of greasing the axle at these parts, othenvise rust will accumulate and jam the spindle.